The Race that Stops a Nation. I mentioned it in my last post as marking the final stop of the crazy train before it makes its reckless descent into the Silly Season, with its whirl of office parties and pre-Christmas drinks. 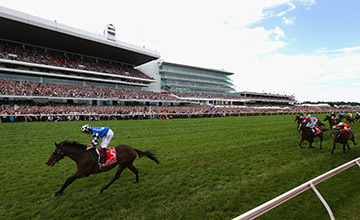 This year’s win, by Protectionist — the first German horse to win the great Australian race — was undeniably convincing. British jockey Ryan Moore rode brilliantly, timing his run towards the post perfectly to finish the 3200m race a full four lengths ahead of Red Cadeaux, who placed second in the big event for a record breaking third time. At our house, the win was celebrated with enthusiasm by Miss Malaprop, who had drawn Protectionist in the two dollar sweep at The Bloke’s office, and by Marvel Girl, who had picked Red Cadeaux in her classroom sweep and won points for her school colour house for placing second. Yep — you read that right — her classroom sweep. That’s how big this race is in Australia: at 3pm on the first Tuesday in November, just about everything stops as the vast majority of the population crowds around television screens, radios, or any other handheld device you care to mention, just to find out who will win the Melbourne Cup: schools, shops, businesses — everything but the betting agencies. It’s so big a deal in Victoria that the metropolitan region of Melbourne has a public holiday. Now, the Melbourne Cup wouldn’t be the race it is were it not for a spot of controversy, but this year it was for all the wrong reasons. It wasn’t just about the use of horse whips, or about the fact that Australia lost over a billion dollars in a single non-productive afternoon, or even about the sordid Instagram feeds depicting inebriated young women passed out face down on the grass or vomiting into garbage bins track side. It wasn’t even about the (very) public marriage proposal made by a canary yellow clad Geoffrey Edelsten to his (very) much younger partner Gabi Grecko in the presence of his estranged (but not quite divorced) wife and a bunch of bemused reporters. No, this year it wasn’t until after the race was run that controversy — closely followed by its near relative, tragedy — came calling. But down in Melbourne, a much bigger drama was unfolding in the yards and stalls of Flemington Racecourse: Admire Rakti, the Japanese horse who had started the race as favourite and placed last, died of a massive heart attack, and Araldo, injured after being spooked in a post-race incident by a couple waving an Australian flag, had to be put down. Two horses — two incredibly beautiful, gloriously honed, impressively muscled and impeccably trained creatures — were dead. No, this year’s race didn’t just stop the nation. This year, it made us pause. And reflect. And wonder whether our armies of once a year punters and frocked-up flutterers might have got this whole horse racing thing slightly out of perspective. This year, I suspect many Australians realised — painfully, perhaps — that the big race, with all its pomp and pagentry and talk of track conditions and trifectas, simply cannot happen without the horses. And that it might be time we took a long hard look at what life is really like for these superb equine athletes all year round, and not just on their day in the November sun. Because if the Melbourne Cup is going to remain relevant as a national obsession, I think many Australians would not want Admire Rakti or Araldo to have died in vain. Hopefully, in future years, we will look back at 2014 as a turning point in Australian horse racing, and we will honour both of these magnificent animals with a lot more than a minute’s silence.